If a monster(s) is Normal or Special Summoned to the zone(s) this card points to (except during the Damage Step): You can add 1 FIRE monster from your GY to your hand, but for the rest of this turn, you cannot Normal Summon/Set or Special Summon monsters with the added monster's name. 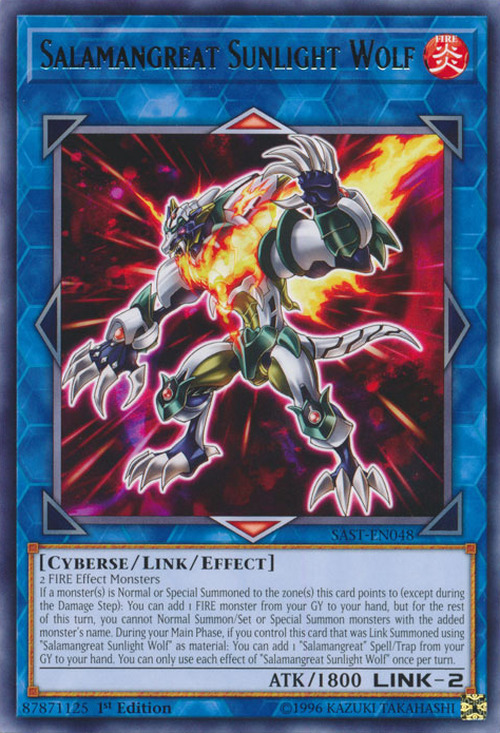 During your Main Phase, if you control this card that was Link Summoned using “Salamangreat Sunlight Wolf” as material: You can add 1 “Salamangreat” Spell/Trap from your GY to your hand. You can only use each effect of “Salamangreat Sunlight Wolf” once per turn. Unlike Salamangreat Heatleo, this card is based on a canid rather than a feline. Ironically, this card is more support-oriented than the Beatdown-focused Heatleo. This monster appears in the card artwork of Salamangreat Rage and Salamangreat Ascetic.